That three-day weekend you’ve been dreaming about isn’t here quite yet, Weekend Warriors, but there are still plenty of fun things to do between now and Sunday night this weekend in the American Dream City! Make dinner plans tonight at Ventana Grille at Tierra Verde Golf Club for live music (The Pontiax), dinner and gorgeous views. Time: Friday from 6 to 10 p.m. Cost: $7 cover for adults, free for kids (not including buffet or cash bar purchases). Learn more. If you’re part Jedi Knight as well as Weekend Warrior, you won’t want to miss the Levitt Pavilion’s free outdoor screening of “Star Wars: The Force Awakens.” Coolers, lawn chairs and blankets are welcome—and bring some cash, because J. Gilligan’s, Bahama Bucks and Mad Mike’s Ice Cream will be there, too! Time: Saturday at 8 p.m. Learn more. 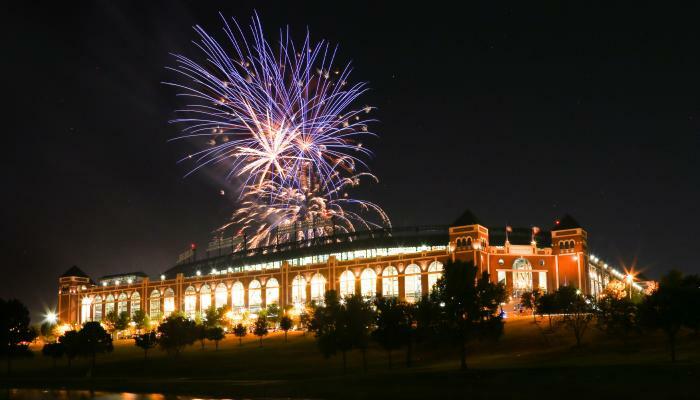 The number-one ranked Texas Rangers will host the Boston Red Sox this weekend, so you know you’ll want to be there to cheer on our boys in blue (Or red. You’ll have to go to a game to find out!) Times: Friday at 7:20 p.m.; Saturday at 8:20 p.m.; Sunday at 2:05 p.m. See ticket prices. Did you know that Downtown Arlington is home to some of the best spas and salons in town? It’s true, so why not book an appointment to spruce up your look or indulge in a little R&R—and then enjoy a relaxing dinner, lunch, or cocktail at one of Downtown’s fine eateries afterward. No doubt about it, the UTA Planetarium is one of the coolest things to do in Arlington. Now showing: “We Are Astronomers,” “Big Bird’s Adventure,” “Secrets of the Cardboard Rocket,” and “Pink Floyd.” Hours: Friday-Sunday afternoons; see website for showtimes. Admission: Begins at $3. More. Three new exciting thrill rides, live entertainment, Pink Things, Funnel Cakes and SO much more is yours for the asking at the premier Texas amusement park. Tickets: Begin at $54.99. Hours: Friday-Sunday, 10:30 a.m. to 10 p.m. More. On tap this weekend: Free outdoor concerts at Levitt Pavilion (Knox Hamilton); R&B, and smooth jazz at Brickhouse Lounge; live music and burgers at Grease Monkey (Darron Williams and the Jim Bowies); and more. “As seen on TV” Arlington restaurant destinations that are oh-so-worth checking out include J. Gilligan’s, Chop House Burgers, Prince Lebanese Grill, Jamaica Gates Caribbean Grill, A Taste of Europe and Sprouts Springroll. Save room for seconds! More. Acrobats and trapeze artists and clowns, oh my! Prepare to be dazzled when the Levitt Pavilion turns in to a virtual big top of fun on Sunday night. Time: 8 p.m. Cost: Free.